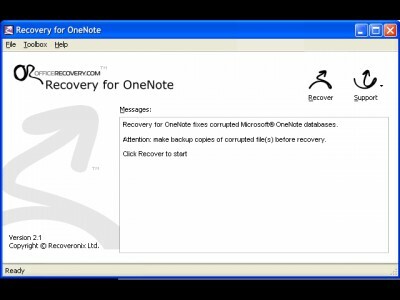 Recovery for OneNote 2.0.0731 is backup & restore software developed by Recoveronix Ltd..
Recovery for OneNote is a powerful data recovery software for damaged Microsoft OneNote files (.ONR). Recovers corrupted notes and their folder assignments. Restores embedded pictures in JPEG, PNG and GIF formats. Easy to use, no special user skills required. Supports Microsoft OneNote 2003. 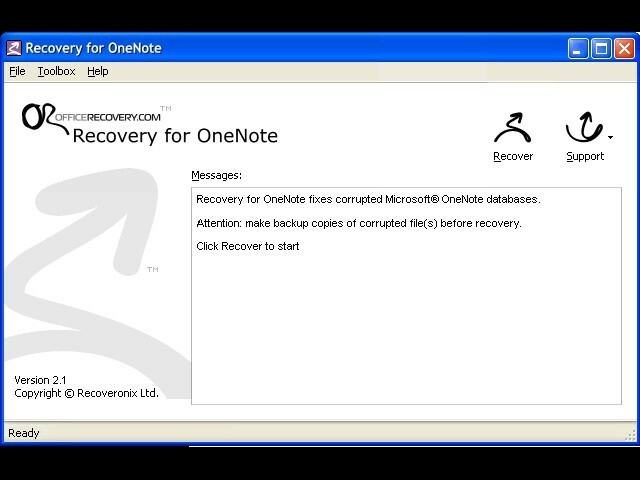 Recovery for OneNote 2.0.0731 supports English interface languages and works with Windows XP/Vista. Latest Recovery for OneNote 2.0.0731 does not contain any spyware and/or advertise modules, allowing installing it with no worries concerning valuable information loss. We has completely tested backup & restore software Recovery for OneNote 2.0.0731 many times, written and published the interesting article and uploaded installation file (866K) to our fast server. Downloading Recovery for OneNote 2.0.0731 will take several seconds if you use fast ADSL connection.